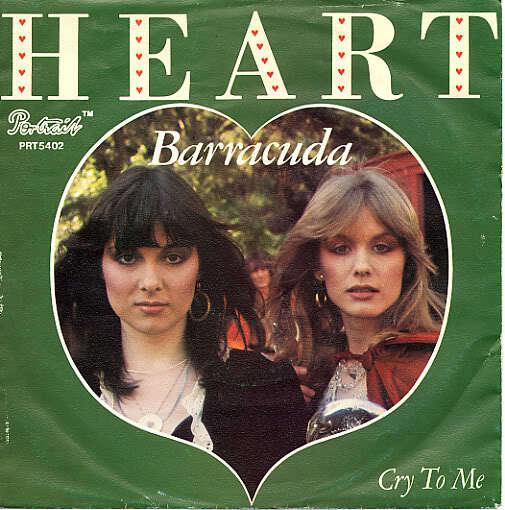 After having regained the number 1 spot last week, ‘Barracuda’ by Heart hung on to it to make the song the 13th to reach at least 7 weeks at 1. It had managed this with an initial 5 week run followed by this 2 week run. 5 of the 13 had been by US acts and 5 by UK acts. Locals had 2 and Pussycat’s ‘Mississippi’ was the only one by an act from the non big 3 nations to manage this so far. ‘Barracuda’ also accounted for the 230th week with an American act at the top of the charts. Clout’s ‘Substitute’ took the climber of the week award for the second week running as it jumped a further 7 places, moving up from 9 to 2 and was putting ‘Barracuda’ under huge pressure. Trevor Rabin saw a second star rater with ‘Fantasy’ which climbed 4 from 17 to 13. The faller of the week was Joe Dolan’s ‘I Need You’ which dropped 5 from 6 to 11 to give him his 6th such award. It was, however, the oldest on the charts with 14 weeks under its belt and was enjoying grandpa status for the second week. ‘Theme from “The Deep” (Down Deep Inside)’ by Donna Summer was the first of 2 songs to go this week. It had seen a run of 5 weeks and a peak of 16. Of her 3 hits to date this was her worst performance. We would be seeing more of her on our charts. Having had the biggest fall last week and ending up at 16, it was not a huge surprise that Baccara’s ‘Sorry, I’m A Lady’ was also leaving the top 20 this week. It had lasted 7 weeks and peaked at 10. Not quite as good as the 15 weeks and peak of 3 that their only other hit so far, ‘Yes Sir, I Can Boogie’ had managed. They would also grace our charts again. British rock band Uriah Heep have had 12 of their albums chart on the UK albums charts, however have only managed to have 2 singles make the singles chart there and neither of those were the first of our new entries this week, their hit, ‘Free me’. The song was written by the band’s guitarist and keyboard player, Ken Hensley, and managed to get to number 8 in Switzerland and Austria and 9 in Germany. Some sources say it made number 1 in New Zealand, while another source only gives it a peak of 3. In case you didn’t know, Uriah Heep were named after a character in Charles Dickens’ ‘David Copperfield’ novel where Heep was one of the baddies. The Bee Gees became the 5th act to clock up 13 or more hits as ‘How Deep is Your Love’ became their 13th song to feature on our top 20. Written by Barry, Robin and Maurice Gibb, the song was originally intended for Yvonne Elliman, but the group recorded it and it found its way onto the ‘Saturday Night Fever’ soundtrack. It made it to the top of the US charts and stayed in the top 10 there for 17 weeks which was a record at that time. It also made it to number 1 in Brazil, Canada, Chile, Finland and France. In the UK it only managed to get to number 3. In 1996, British boy band, Take That took a cover version to the top of the UK charts and also topped the Danish, Irish, Italian and Spanish charts with their version. At the time it looked to be the Take That’s last ever release, but they re-formed in 2006 (10 years later) and continued to have further hits. This was the 17th hit that Barry had song writing credits on and this put his tied 5th with Geoff Stephens and Barry Mason for number of hits by a song writer. There had been a gap of 258 weeks between this and the previous Bee Gee hit (‘Run To Me’) and this was the tied 20th biggest gap between hits for an artist equalling the gap that Peter Lotis saw back in 1973. It was the 4th biggest gap for a British act. With Clout’s ‘Substitute’ at 2, Margaret Singana’s ‘I Never Loved a Man (the Way I Love You)’ at 3 and McCully Workshop’s ‘Buccaneer’ at 5, this was the 32nd time we had seen 3 of the top 5 songs being by local acts. Sadly, this would be the last time we would manage this. We had once seen the locals have an all time record 4 of the top 5 which was back in November 1972. With both new entries being by British acts, the gap between the number of hits the Americans had managed and those that the Brits had managed was 18 (480 vs 462 hits) and this was the first time in 16 weeks that this gap had been below 20. This week saw Margaret Singana reach 30 weeks in the charts, Wings reach 40 and Leo Sayer reach 60. Sayer was the 37th to reach his milestone, Wings the 83rd to reach theirs and Singana the 118th to reach 30. So far 35 local acts had manged 30 or more. Abba moved into tied 3rd place on the overall weeks count list as their 131 so far put them level with Elvis Presley. The 2 acts were just 6 behind The Hollies in second place but had a way to go to catch overall leader Tom Jones who was on 185. Both Elvis and The Hollies had finished their SA chart careers so it was now Abba, and The Bee Gees, who were in 5th place on 126 who looked most likely to take over the lead from Jones if anyone would. This week also saw the 5th time the top 2 hits had a 1 word title and a single word act with Heart’s ‘Barracuda’ at 1 and Clout’s ‘Substitute’ at 2. Previously we had seen Pussycat’s ‘Mississippi’ and ‘Georgie’ at 1 and 2, then we had 3 weeks with Pussycat’s ‘Mississippi’ and Sherbet’s ‘Howzat’ sharing the top 2 places. This would be the last time we would see a top 2 like this.